Note: While this review will be spoiler free, it will make reference to previous books. 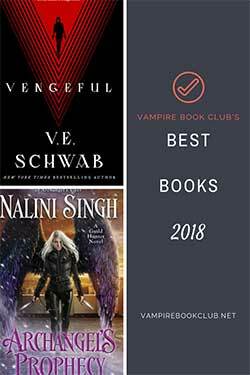 If you haven’t seen started this series yet, check out VBC’s review of book 1, Some Girls Bite. I am an unabashed Merit fangirl. 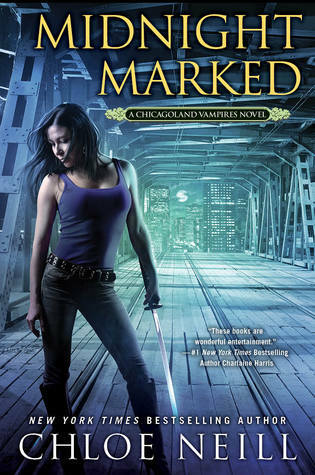 I get all giddy when there’s a new Chicagoland Vampires book available. And with Midnight Marked, there is so very much to be giddy about. Dark Debt had Merit and Ethan crossing paths with a sly and powerful new enemy. Adrian Reed doesn’t like that he’s been bested by the Master of Cadogan House, and he’s going to do everything in his considerable power to bring down Ethan. Someone’s using alchemy in the Windy City, and the strange thing is, it seems that the previously debunked magic is actually working. Merit’s convinced Reed is connected, but she doesn’t know how, and she doesn’t know how the magic is causing all this havoc, either. Between Merit, Ethan, the Ombuddies, and the newlywed Bells, they’ve got some serious knowledge and firepower, but it may not be enough to stop whatever Reed has planned. We’re nearing the end of the series (I think I may cry), so these characters and this world are familiar friends. Merit’s come a long, long way from her first days as a vampire, and her confidence in her abilities, the certainty that she’ll be listened to, and especially the strength she pulls from her relationship with Ethan are some of my favorite parts of her. We’ve seen them fight and make up; we’ve seen Ethan turn away from her and then ask for forgiveness; we’ve seen them grow together and make each other the best they can be. If there was any doubt remaining that these two are perfect for each other, it’s completely gone. Plus, there’s a scene in the library that’s just hot. While the mystery in Midnight Marked wasn’t as complex or nuanced as Dark Debt, the addition of a relatively unknown form of magic was a strong addition to the world Neill’s created. She plays on the doubts and the existing mythology surrounding alchemy and makes it work. Then she adds in the other supernatural factions within Chicago, upping the tension and forcing everything to a head. 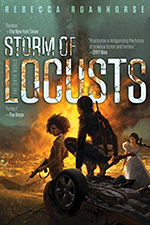 It falls a bit short because the ending twist wasn’t much of a surprise, and left me wondering what kind of Bad Thing could possibly happen in the last book. There’s snark, though not as much food, and Merit in a fancy dress. There’s girlbonding moments with Mallory and a bittersweet interaction with Jonah (can I have a Jonah book?). This close to the end of Merit’s journey, there’s a certain thread of finality running through Midnight Marked. Watching Merit embrace her strength and powers has been a hell of a lot of fun, and I’m not quite ready to give her up. How many books will the series have? I completely agree that the ending twist fell a little short, but I still enjoyed Midnight Marked for all the things you said. I really don’t know what I’ll do when this series is done. Ever since I found out about the series (from VBC by the way), they’ve been a staple in my reading every year with each new release.